If there ever were hard times for General Motors of Canada Limited, the 1930s certainly stretched the company’s resources to the very limit. Production and sales were miserable for all of the GM brands throughout the Dirty Thirties. From a high water mark of 104,198 vehicles produced in 1928, the Oshawa, Ontario-based automaker hit rock bottom in 1932 when only 19,565 cars and trucks were shipped from the factory. Among that pittance were 2,026 McLaughlin-Buick passenger cars. McLaughlin-Buick production inched upward in 1933 to 2,382 units and up again to 4,091 units in 1934. The increases were small but they did give hope that the worst of the Great Depression might be over. That was not to be the case and the final production figure for 1935 skidded to a dismal 2,272 units. A sleek new Art Deco design helped spur sales in 1936 as 4,722 McLaughlin-Buicks were rolled out the factory doors. Among that number was one built for His Majesty, King Edward VIII. Despite being all new last year, the cars were revamped in a big way for the 1937 model year. 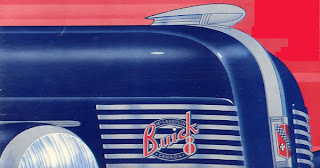 The grille was split, allowing the Buick coat of arms to be mounted front and centre on a slender river of chrome flanked with fine horizontal chrome ribs. New, more graceful, teardrop headlights were mounted on either side of the grille for a stately look. Wipers were no longer mounted from above the windshield, but from the cowl. The radio aerial disappeared, discretely embedded in the running board. Body height was lowered by 1.5 inches and a corresponding 2.5-inch drop in the floor meant the cavernous interior was maintained. The public met the 1937 McLaughlin-Buicks in November of 1936. In a bid to impress potential buyers, sales personnel were trained to discuss the current crop of automobiles from the ground up. Starting with the famous sealed chassis, they moved on to point out the quieter valve-in-head straight-eight engine, the five-point soft rubber engine mountings, the centre-point controlled steering, the tip-toe hydraulic brakes, knee action wheels, torque-tube drive and ride stabilizers located fore and aft. The car was mighty and magnificent. It came with an impeccable pedigree that reached back to horse and buggy days. It was easy to sing the praises of such a fine motorcar. Salesmen were instructed to draw attention to the all steel-welded-to-steel body construction that boasted the safety of a solid steel Turret Top on the Special models. “McLaughlin-Buick bodies have in 1937 the same master craftsmanship in their coachwork which they have had for years.” For good measure, folks looking at the gleaming beauties in showrooms were reminded that safety glass was used all around. The McLaughlin-Buick was an upscale offering in the world of automobiles, carefully positioned between the mid-range, mid-priced Oldsmobile and just below the luxurious LaSalle by Cadillac. With inspired whispers of elegance, distinction and class, McLaughlin-Buick came in four distinct series for 1937: Special, Century, Roadmaster and the Limited. The 122-inch wheelbased Special was the entry level car, ideal for the family ready to move into the pampered world of McLaughlin-Buick. A Sport Coupe with “ingeniously positioned” folding opera seats was the lowest priced in the stable with a starting price of $1,055. A five-passenger Coach with trunk, a five-passenger Sedan with trunk and a four-passenger convertible with rumble seat were all equally modestly priced. The Special got around town and country with a 248-cubic inch straight eight that generated 100 horsepower. The spare tire rode in a special space below the trunk floor, making tire changing less of a hassle. Having stated that, these dignified land yachts also could be ordered with optional cost, side-mounted tires, neatly tucked into gracefully elongated front fenders. The classic feature was standard equipment on the Roadmaster four-door convertible and the two Limited models. Further up the scale was the impressive Roadmaster. This grand automobile stretched lazily over a 131-inch wheelbase and seated six in full comfort. It shared an engine with the Century. The Formal Sedan could be ordered with optional movable glass partition to set passengers apart from the chauffeur. A four-door convertible carried a price tag of $2,050. Gliding majestically on a 138-inch wheelbase, the Limited was the penultimate McLaughlin-Buick. Seating eight passengers, it was offered as a Sedan with trunk or as the Imperial Sedan with trunk. It loafed along the highways and byways of the Dominion with the same engine as Century and Roadmaster. These distinguished vehicles were rarely seen. Shunning Cadillac as ostentatious, Prime Minister William Lyon Mackenzie King made use of a McLaughlin-Buick as his official car. Options were few and far between on a car as magnificent as a McLaughlin-Buick. There were a few and in keeping with the McLaughlin-Buick tradition they were the epitome of tastefulness. They included white sidewall tires, an in-dash radio with a speaker. A heater—with or without the new windshield defroster—fog lights and the dual sidemount fenders were on the short list. Production continued to improve as workers at General Motors built 6,880 McLaughlin-Buicks for the 1937 calendar year. The gains would not be continued in 1938 as the economy faltered and sales plunged.